The novel follows Menolly, now apprenticed into the Harper Hall, a type of music conservatory for harpers (minstrels/educators) and other music professionals, as she begins her musical training to become a harper herself one day. The story begins within hours of the final events of Dragonsong, rounding out the tale of Menolly's coming of age. Menolly finds life in the Harper Hall challenging, and through the events of the novel struggles to make a place for herself. Although she is glad to be accepted as a musician and encouraged to play and write music by most of the authority figures at Harper Hall, she must still deal with those who dislike her for her talents or don't believe she has any real talent at all. At first she is placed in living quarters and classes with a group of paying female students who are, in the majority, extremely unpleasant. She also finds herself torn between master musicians who have conflicting emphases and who want her to specialize in their techniques, instead of developing her own. 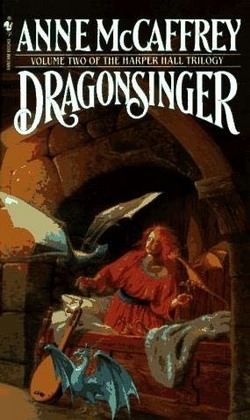 The situation is complicated by her nine fire lizards, small dragon-like creatures whose properties are still being explored at the time of the story; while some members of the Pern communities want her help in learning what fire lizards can do, many of her teachers in the Harper Hall see them as a nuisance and a distraction that will keep her from developing her musical gifts. Even through her struggles she gains a handful of faithful friends beyond her fire lizards, including Piemur a fellow apprentice and Journeyman Sebell. Over time she finds her place as a musician within the harper system and is accepted as having her apprenticeship being completed under the Harper she grew up with at home. In the end, her fears of losing her possessions and position are secured when she is awarded the position of Journeyman Harper.